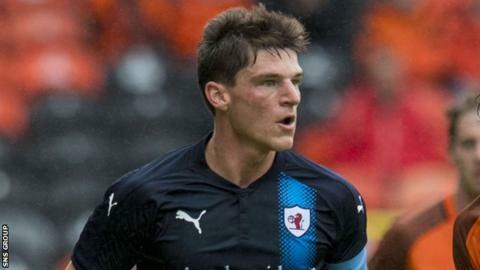 Craig Levein has made his first signings since taking charge of Hearts for a second time by bringing in midfielders Manuel Milinkovic and Ross Callachan. Winger Milinkovic, 23, joins on a season-long loan from Italian Serie A side Genoa. Callachan, also 23, has signed a two-year contract after moving from Raith Rovers for an undisclosed fee. "I can't wait to get started now," Milinkovic told the Hearts website. Striker Dylan Bikey left Tynecastle to join Doxa Katokopias in Cyprus and defender Andraz Struna's move to New York City was also completed before the transfer window closed on Thursday. Between them, Bikey and Struna made 19 appearances for Hearts last season. And Hearts also confirmed Canadian defender Marcus Godinho has joined Berwick Rangers on loan until January. Since signing for Genoa in the 2015/16 season, Milinkovic has had spells at Virtus Lanciano and Messina, and had moved on loan to Serie B side Foggia in the summer but that move has not worked out. "I've seen the stadium and it looks fantastic," said the France-born Milinkovic. "I've also watched clips of Hearts games online and to see such a packed stadium is amazing. I can't wait to play in front of these fans. "I'm a player who likes having the ball at my feet, to run at the opponents and provide assists for my teammates." Callachan was captain at Stark's Park and made his 125th senior appearance in Saturday's 5-0 win at East Fife, which took them top of League One. He scored eight goals for Rovers after making his debut in May 2011. "I grew up watching Hearts and for them to come in with an offer for me, it's a dream come true really," Callachan told Hearts TV. "In terms of what fans can expect, I'd say I'm quite an energetic player, a box-to-box midfielder. I like to get around the park and I can put myself about a bit as well. "I've played a lot of games for my age and I feel now is the right time to step up and I'm ready to challenge myself here." Hearts' third deadline day addition was forward Aiden Kenna from St Patrick's Athletic.